Santa Barbara Police Foundation is a registered 501(c)(3) Non-Profit Organization. Donations are tax-deductible. 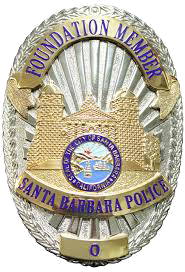 All donations to the Santa Barbara Police Foundation will be used for the programs and initiatives of the Santa Barbara Police Foundation as directed by the Board of Directors. The SBPF is a 501(c)(3) nonprofit organization. Your donation is tax deductible. Please check with your tax advisor. If you have made an error in making your donation or change your mind about contributing to the Santa Barbara Police Foundation, we will honor your request for a refund made within 15 days of your donation. To request a refund, please contact us. Refunds are returned using the original method of payment. If you made your donation by credit card, your refund will be credited to that same credit card. SBPF respects and protects your privacy. SBPF will never sell, distribute, or rent your personal information to other individuals or companies. When you make a donation, your name may be included in SBPF newsletters, on the website and/or other publications related to the SBPF activities. If you do not wish to share your name, or you choose to make your donation anonymously, SBPF will honor your request. When you donate online at www.Santabarbarapolicefoundation.com, you will receive an acknowledgment of your donation for your records, and may receive an occasional email and/or information delivered by postal mail. If you do not wish to hear from us, please contact us.